At Nangia Advisors LLP, we provide quality professional services in an independent, objective, and ethical manner by bringing a new insight and fresh perspective to every issue. 1To maintain at all times the highest professional standards of independence, integrity, ethics and objectivity. 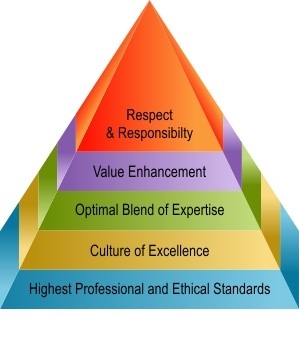 2To promote excellence as a way of life and culture of our firm, which reflects in all we do. 3To impart the optimal blend of expertise to every assignment with the objective of developing practical and tailor made solutions for our clients. 4To develop innovative and out of the box solutions which result in value enhancement for our clients. 5To recognise, respect and honestly discharge our responsibility to our clients, our people and the society at large. Our dedicated professional team has carved a discernible niche for itself in the professional services industry. Our endeavor is to provide qualitative and expert professional services rendered efficaciously, sagaciously and with keen attention to details. We recognize the need to provide timely, focused and issue-based advice to our clients.